Next week is Scott's spring break, so he needs an indoor project to take on. 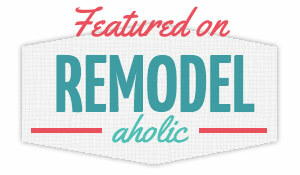 Our weather has been so crazy lately - six inches of snow in Texas in the past week - that we don't feel like starting the backyard makeover just yet. There is, however, a part of the house that have been driving me nuts for a long time: my closet! It's stuffed into a corner of our bathroom, and it's not very spacious. Did I mention I have a lot of clothes? Because I definitely do. 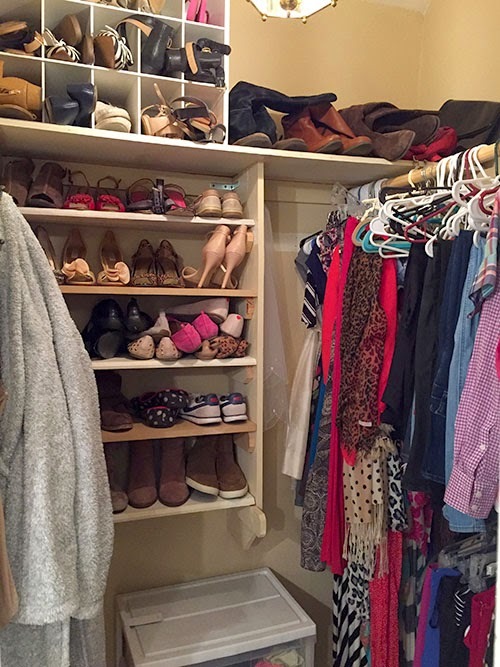 And I really need to make better use of my small closet so that my floor isn't constantly covered in shoes, purses and dirty laundry. I'm so excited because we went to Ikea today and bought some of their closet storage solutions. We bought some of these storage bins, two of these Komplement drawers and four of these pull-out wire baskets. 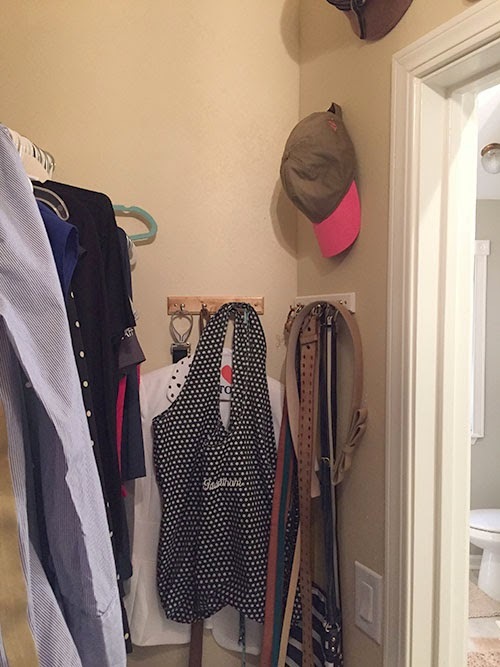 The husband is going to try to help me make sense of this space like he did for his custom wall of closets. He'll start building the pieces this weekend. I can't wait! 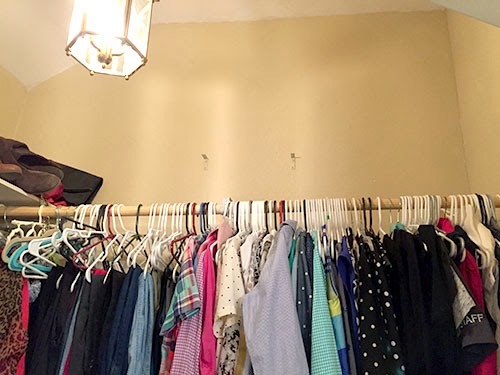 I actually have a lot of vertical space above my clothes, so we're trying to figure out how to make use of it. It's a challenge because I can't reach it, so I have to put stuff up there that I don't need every day. I'm not sure what we'll do, but we'll have to be creative and come up with something. 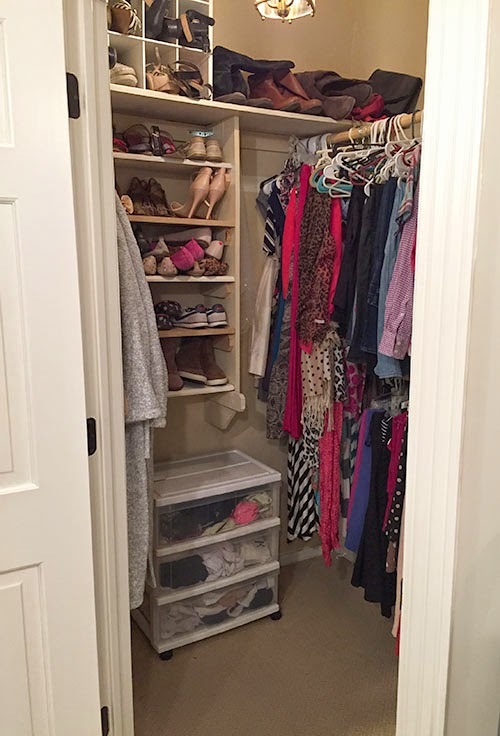 Of course I've been perusing Pinterest, looking for brilliant closet organizing ideas and similar layouts to my space. I found this awesome makeover by View Along the Way that really blew me away. She had a lot of great ideas that inspired me, such as adding some pattern to the wall and bringing in some really feminine touches with the chandelier and mirror. I'll keep you posted as we make progress! As always, follow along on Instagram (@jordanG106) and Twitter (@HappyHomebodies) for live project updates. 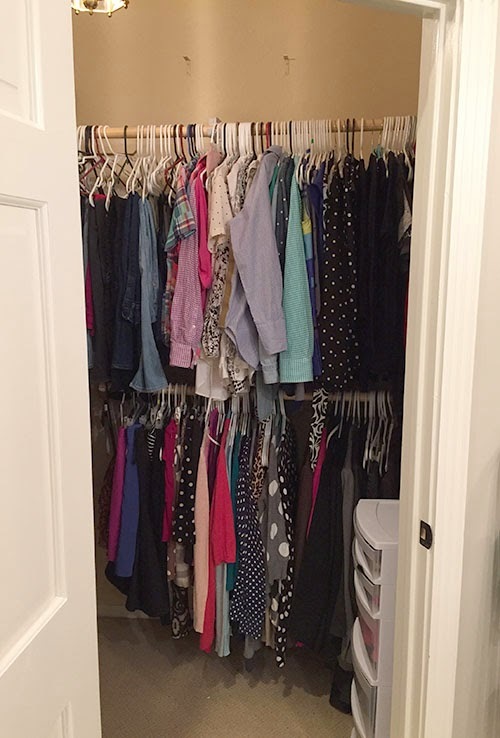 Oh, and I'd love to hear your idea for how you would maximize that vertical space in my closet. That's the trickiest part of the project, and I'm open to any and all suggestions!